Background: On Tuesday, 8 December, Riedewhaan and Nafeesa from FCW planned a meeting at the stadium to meet the committee members our team had been working with the past few weeks, as well as to arrange plans with Vygieskraal for the future. We went into this group meeting with high hopes, knowing that it was the day that FCW staff would lay down plans for future work with Vygieskraal. However, the day was tinted with bittersweet feelings because it was also our last day working with our co-researchers. Riedewhaan, Nafeesa, and Magrieta arrived at the stadium just before 10AM, and Camelita and Lameez arrived shortly after. Bhuti was the first of the committee members to arrive, and Bongani, Nokwanda, and Sydwell soon followed. After waiting for all parties to be present, the meeting began and a tray of muffins was passed around, as well as some of the pictures we had developed for our co-researchers. Initially, none of us really knew where to start, but Riedewhaan cleared the air by asking a general question to try to see if both FCW and the committee were on the same page. Bhuti took the lead and began speaking about the need for improvement in children’s educations in Vygieskraal, particularly in relation to crèche-age children. 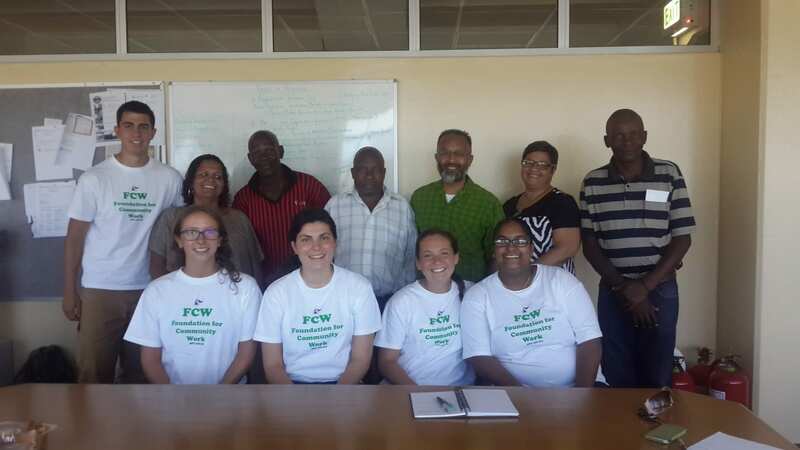 The future of ECD access in Vygieskraal was mentioned, and Riedewhaan spoke about plans for the committee to carry on working with FCW in the New Year, emphasizing his desire to continue conversation with those interested. Bhuti expressed that he was familiar with FCW’s Family in Focus (FIF) programme, a programme that works to serve families living in impoverished areas with the assistance of trained community members acting as home visitors who promote ECD and healthy family relationships. We also learned that Bhuti actually serves on the FIF committee in Athlone; Riedewhaan seemed happily surprised by this, since he now knew of someone who could represent FIF in Vygieskraal. Collectively as a group, plans started to be made for the future, which included strengthening the programmes in Vygieskraal, as well as working with FIF Athlone to target the Vygieskraal settlement. Discussion on the roles of the committee members in the future ensued, and Bhuti remarked that, “Us parents are always letting children down.” The conversation then took a turn, and went on to touch upon the fact that coloured and blacks grow up playing together, but when children grow up, they also grow apart. The committee members all agreed that now, with FCW, they will try their best to do something positive for the community and for the children. A second meeting between FCW staff and the committee members was set up for Thursday, 14 January in the coming year. This was a huge step forward because over the past couple weeks, we had struggled to find common ground between the committees in Vygieskraal, and were finally able to schedule a time for them to talk with FCW staff about making positive change in the settlement for the children. Towards the end of the conversation, Sydwell brought up that Vygieskraal had been promised things in the past – by the city, by the ward councillor, and by other parties – but the promises were never kept. He seemed hesitant and slightly worried that this might be another one of those instances. Riedewhaan was quick to reassure him that FCW was not only promising to work with Vygieskraal, but was committed to making the promise a reality. Some logistics were discussed, but the meeting ended on a positive note as details for the meeting in January were ironed out. Everyone present seemed hopeful for the continuation and future growth of the relationship between Vygieskraal and FCW. Our team was pleased with how well the meeting with members of FCW and the committee went. Having the chance to sit down with the committee members, who we had become very close with over the past month, as well as FCW employees, who we had been with since day one, was a great way to end our work in Vygieskraal. Knowing that there are plans for FCW to continue working with Vygieskraal in the future, despite all of the ups and downs we had experienced, made us feel overwhelmed with joy and hope. Hope for the future, for FCW, for Vygieskraal, and for the committee members who we knew we would miss so much when we left.